So, you too heard that KCS works and tried implementing it in your organization, eh? Good. It actually does, but how’s it working for you? Or are you planning on implementing it, but still trying to figure out how? Sounds a bit complicated, doesn’t it? Fret not; it’s not as overwhelming as it sounds. We’ve cracked it for you. 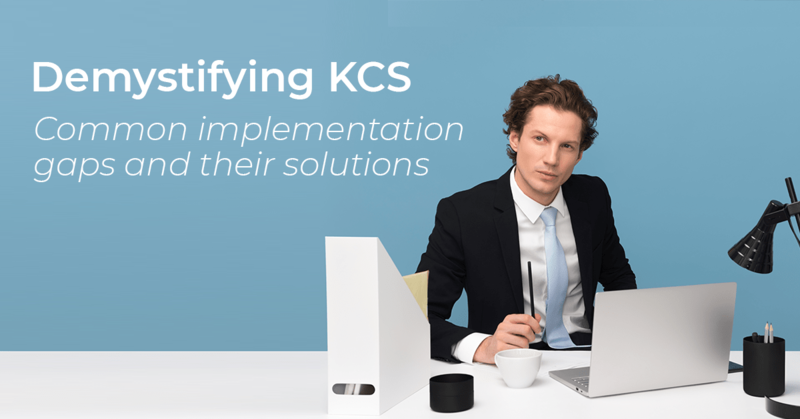 Read our eBook to understand what KCS is, how it works, and how you can successfully implement it in your organization. Not only that, you’ll also learn about the usual lacunae in KCS implementation and some best practices to bridge them. We don’t claim that you’d be a KCS Coach after reading it, but heck, you’ll definitely know enough to bring about significant changes in your organization. What are you waiting for? Download it right away and get reading! And you’re always welcome to reach out to us if you have any follow-up queries. Not just KCS, should you have any questions about scaling support operations, increasing CSAT, improving agent efficiency, or reducing support cost, just pop an email to info@searchunify.com and we’d love to assist you.